Any frequent readers of the site are aware of my interest in politics and the political aspects of games. I could babble on all day about human and turian antagonisms in Mass Effect 2. What I have not written about extensively on the site are my own academic interests, serious or social impact games. The genre, if we can call it that, is cluttered with a variety of different game types, from crowdsourced productive games to educational and persuasive games. The field even includes that oh so popular and deeply troubling word, “gamification.” My own studies center around global systems (I know, terribly vague) and game design, but I will save that topic for another day. For this post, I want to draw your attention to a game that recently caught my attention. Spent is a game developed by McKinney, a U.S. based ad agency that has produced copy for the likes of Nike, Sony, and Travelocity. McKinney produced Spent in conjunction with Urban Ministries of Durham (UMD), a non-profit organization in Durham, North Carolina that serves the city’s homeless population through a variety of programs, including the provision of food, shelter, and clothing for their impoverished constituents. The organization serves upwards of 6,000 individuals, the majority of whom are teetering on the edge of homelessness. UMD’s intent with Spent is to draw attention to their services, ideally to raise funds and encourage donations, but also to raise awareness about the precarious situation many Americans find themselves in on a regular basis. 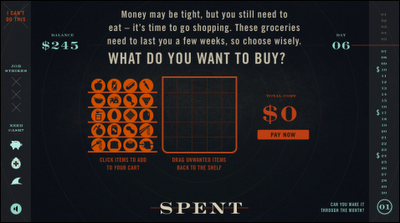 Spent is a minimally interactive question and answer game, burdening players with the difficult task of getting by on very little income. Players start with a mere $1,000 and must find a job to avoid homelessness during a single month. Quickly, additional costs start to pile up, and players must try to maximize their income and minimize expenses in order to increase their total capital. Once you have a job, should you shell out for health insurance? Will you leave in a cheaper residential area, but live farther away from your place of work? When cash is tight, would you pay for your child to bring their friend’s birthday presents? Gamers are quite adept at turning even the most narrative intricate experience into a game of cost-benefit analysis. Spent exploits this tendency, intentionally transforming difficult decisions into simple answers given the game’s context. The point is clear: when someone is one paycheck away from homelessness, irrational and amoral decisions suddenly become logical. Deciding not to pay for health insurance, or even for one doctor’s visit, makes sense when the money is so low - even when a sudden illness could cripple one’s prospects. One particularly clever design choice allows players to “ask a friend for help” to store belongings, or overcome another sort of burden. Selecting this option brings up a facebook update option, actually allowing players to ask their real life friends for help. While the fictional plea for assistance is mostly intended to draw new players to the game, it also makes the decision more real. There is a great deal of shame and embarrassment around poverty, Spent evokes a fraction of these emotions by asking players to contemplate the prospect of relying on friends and revealing one’s needs. While you can certainly maximize your income and end the game with a gain in capital, it is clear such an achievement comes at great personal cost. When it comes to dealing with poverty, you do not win, you just get lucky. Spent is not a particularly controversial game, but it does ask us important questions no one is eager to answer. Well said. I particularly like your thoughts on the exploitation of the simple cost:benefit analysis that games do so well. I can really easily imagine this causing a player who happens to be hard-minded about poverty to rethink their views a little. It isn't uncommon to hear a hard-nosed individual say things like "they just need to pull themselves up, by their bootstraps", but framed as this game is, that cost becomes a lot more personalized, and it becomes easy to see why someone would struggle against always doing the practical thing.